1. While on the pricing page, click the Upgrade button to your preferred plan. 2. 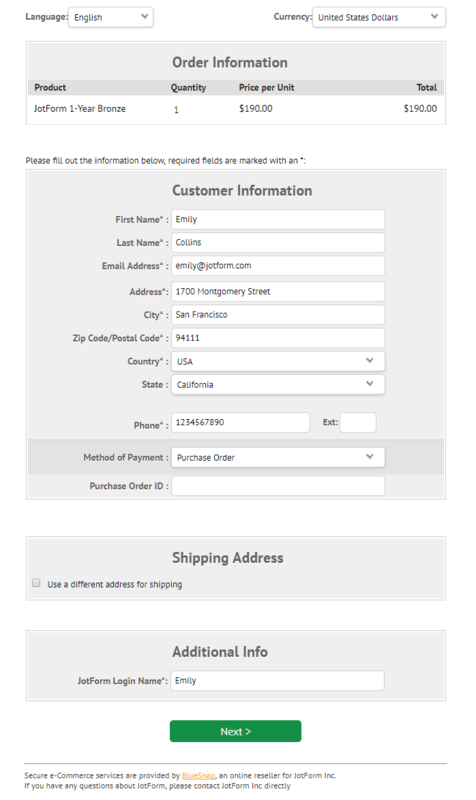 Select the Check/Purchase Order/Wire Transfer option. Note: There's a minimum amount required when paying via Purchase order since there is some manual labor involved so you will need to purchase yearly or bi-yearly plans. 3. Click the "Upgrade" button. This will open a new window for providing your personal and/or customer information. 4. Fill everything in the page including your Jotform Login Name which will be your Jotform Username and not the email address. 6. Clicking the "Next" button will redirect you to the last page where you can see the Purchase Order Instructions and Purchase Order Procedure information. Please save a copy of the page for future inquiries. We do not give a timeframe for this type of payment. You must strictly follow the Purchase Order Instructions. Once BlueSnap will process the Order, it will be sent to us for Approval. Once the order is approved, you'll get an additional email with instructions on how you should send the payment. We cannot upgrade the account until the payment is cleared. If you have any comments or issues with this method, please let us know by posting to our support forum. please send me your IBAN-Adress and anythig else for my payment.